Trucking companies and truck rental companies are expanding their offerings with more sophisticated advanced safety features as the cost of the technology begins to drop. The adoption of active safety systems by the major rental firms represents an important transition for the industry because the proliferating technology is accessible to carriers and shippers that source their fleets from companies such as Penske Truck Rental and Ryder System Inc. While many big trucking companies have long adopted forward collision alerts, the new technology is more capable and more affordable. Over time the price of the more advanced systems has decreased, and the payback for onboard safety systems is down to just 12 to 14 months, within the time a major carrier might turn over a truck, Murray said. That’s why trucking companies that operate larger fleets are eager to invest in the technology, he said. Penske Truck Rental will now make collision avoidance systems and air disc brakes standard features on commercial tractors within its rental fleet. Rival fleet management company Ryder System Inc. has also been laying the groundwork for safety technology upgrades to its fleet. 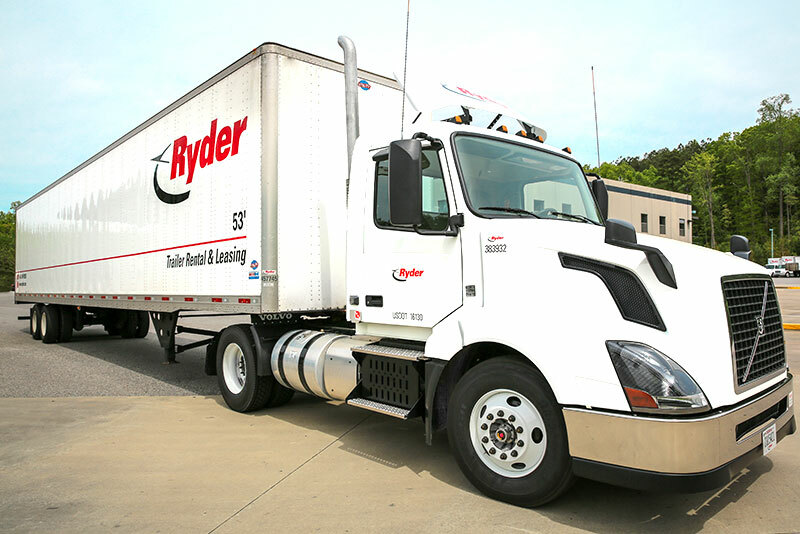 The company began adding forward looking radar and collision mitigation systems into standard specifications for its commercial rental fleet last year, said Scott Perry, Ryder’s chief technology and procurement officer. 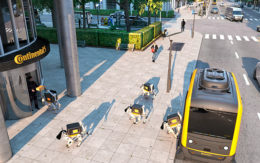 “The new generation of active control systems to avoid or lessen the severity of collisions has shown tremendous value by reducing collision costs, lost time and injuries,” said Bill Van Amburg, senior vice president for clean transportation industry group Calstart. “[The systems] have this greater capability because of the continuing rapid advances in computing and sensor systems and their active linkage to braking and powertrain controls rather than just being driver alerts,” Van Amburg said. Active braking has already proven valuable in the increasingly mixed traffic and congested freeway system truckers now face, he said. Penske’s first order comprises more than 2,000 new commercial semi-trucks from Freightliner, Volvo and Navistar that will be available for use in February. 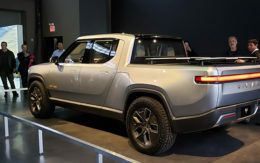 Deliveries of Ryder’s new vehicles will begin next month and be available to customers soon after, Perry said. Ryder did not disclose details on the size of the fleet that will feature the additional safety technologies. Even though the investment in the safety technology is significant, both Penske, Ryder and other large fleet operators are poised to save long-term by lowering crash costs. The biggest savings come from crash reduction. Adding the technology is not an effective way to lower insurance premiums because those costs rise for external reasons that can vary state-to-state, Murray said. Penske Truck Leasing, which oversees the commercial rental subsidiary, saw the technology becoming more in demand among its multi-year leasing customer base. “Our lease customers [had] been spec’ing these features onto their units,” Paul Rosa, senior vice president of procurement and fleet planning, Penske Truck Leasing told Trucks.com. Companies with a multi-year lease package that operate smaller fleets of trucks over an extended period can choose the manufacturer of the vehicle as well as the features included. Now Penske’s investment will benefit its rental customers by bringing access to advanced safety features that smaller businesses otherwise couldn’t afford. And the long-term lessees will reap additional crash cost reduction when supplementing with rental vehicles if their fleet size requires situational expansion. Some of Penske’s largest commercial rental customers are the package delivery companies, Rosa said. Although shippers like UPS and FedEx manage their own fleets, they turn to companies like Ryder and Penske during seasonal surges. To enable UPS to operate more pickup and delivery routes during the recent onslaught of holiday e-commerce spending, the company opened 23 temporary mobile delivery centers with more than 1,100 additional delivery vehicle positions, said Kim Krebs, a UPS spokesperson. UPS did not provide the exact number of rental vehicles, but instead explained that the added “positions” were designed to support short-term expansion of the fleet beyond its nearly 105,000 package cars, vans, tractors and motorcycles. And added safety features are a purchase consideration for the company when planning for high-traffic periods. UPS will take collision avoidance features into account in addition to the overall negotiated price when looking at any rental vehicles to use during peak seasons, said UPS spokesperson Kyle Peterson. As for its own commercial fleet, UPS is ahead of the game. Collision mitigation technology has been standard equipment on all Class 8 tractors it has ordered since mid-2015. That totals deliveries of at least 2,600 vehicles. FedEx told Trucks.com in a statement that safety is its top priority and that it will continue to adopt comprehensive safety and preventive maintenance programs, as well as proven safety technologies like forward-collision warning systems. However, the shipping giant did not say whether it is equipping its vehicles with these new onboard safety features. “While not fully automated, this is a step along the continuum that has shown real value, and signals how fast the move toward ‘greater’ automation – starting with safety technology – is moving forward,” Van Amburg said.